The development of the Global Health Initiative Fund is a significant step towards addressing pressing health care needs, educating young doctors in global health issues and encouraging the growth of primary care doctors. The world is in need of sustainable health care, with a greater need in under-resourced countries. People around the globe need doctors - not only doctors who are well educated and highly trained, but doctors who are excited about what they do every day. We strive to help mentor the physicians of tomorrow by meeting today’s health care needs. Since 2008, the Global Health Initiative has funded over 400 medical students to serve in 35 different resource-limited countries around the world. In Uganda, 51% of the population does not have any contact with public health care facilities. 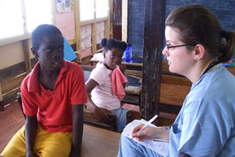 Your help with our Global Health Initiative Fund serves to give our students, residents, fellows and faculty members at Northwestern University's Feinberg School of Medicine an educational experience that will inspire them throughout their medical careers. Specialty and Geographic Distribution of the Physician Workforce: What influences medical student & resident choices? Easing the Shortage in Adult Primary Care - Is It All about Money? For further reading, please see Factors Associated With Medical Students’ Career Choices Regarding Internal Medicine JAMA, September 10, 2008 – Vol. 300, No. 10.